This week I thought I would share another card that I made based on an earlier card I had made. 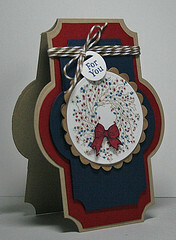 Plus I decided to inflict on you share with you a tutorial on how I made it. Ok now for the tutorial. I think this may be my very first tutorial so please be patient with me :D.
This is what I used. I forgot to add the scissors & Copics. 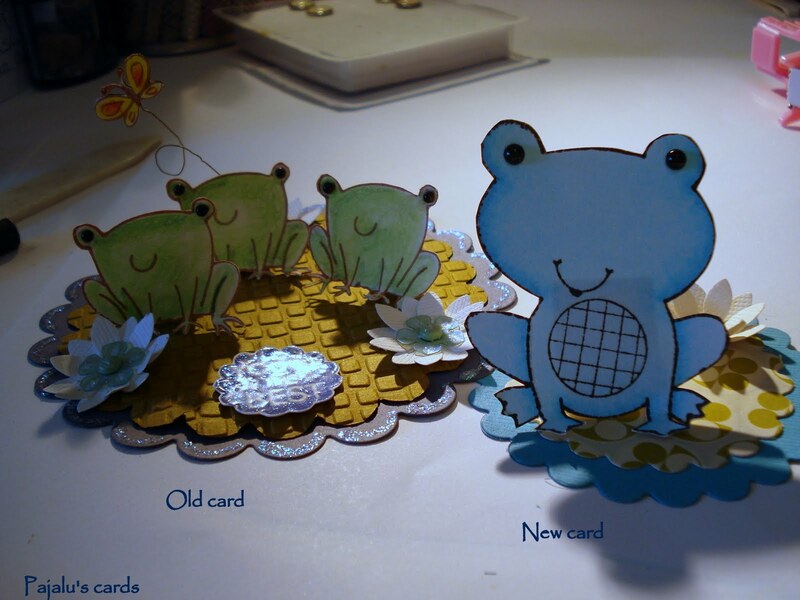 I used my scallop circle nestibilities in two sizes for the water & Lily pad. 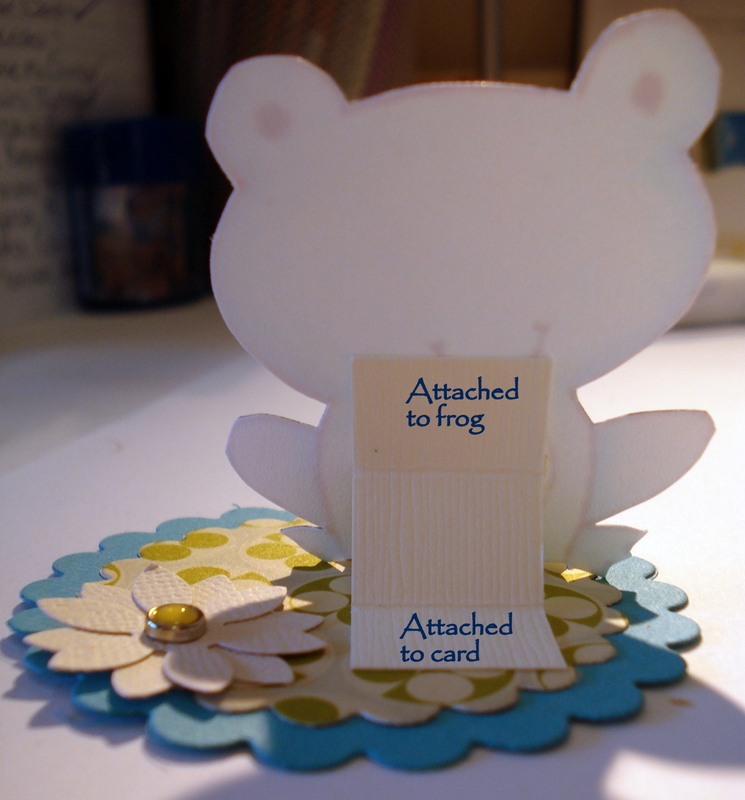 The frog stamp is by Kaiser craft. As you can see I've made the "water" bigger than the lily pad just for a bit of contrast. I have then lined up the scallops (this isn't necessary) before piercing a hole in the two layers. Next punch two flowers out & place together & put a brad in the centre. Then put the brad through the two layers of scalloped paper & open the prongs. You should be able to move the Lily pad (top smaller scallop) away from the bottom. Next step is to attach the frog. This next step depends on the size of your stamp. After cutting around the stamped coloured image, I eyeball the size for the flap. I score about 1/4 inch from each end & apply double sided tape to the ends (on the same side of the c/s). I then work out how far up the stamped image I need to place the flap & adhere the flap to the image. 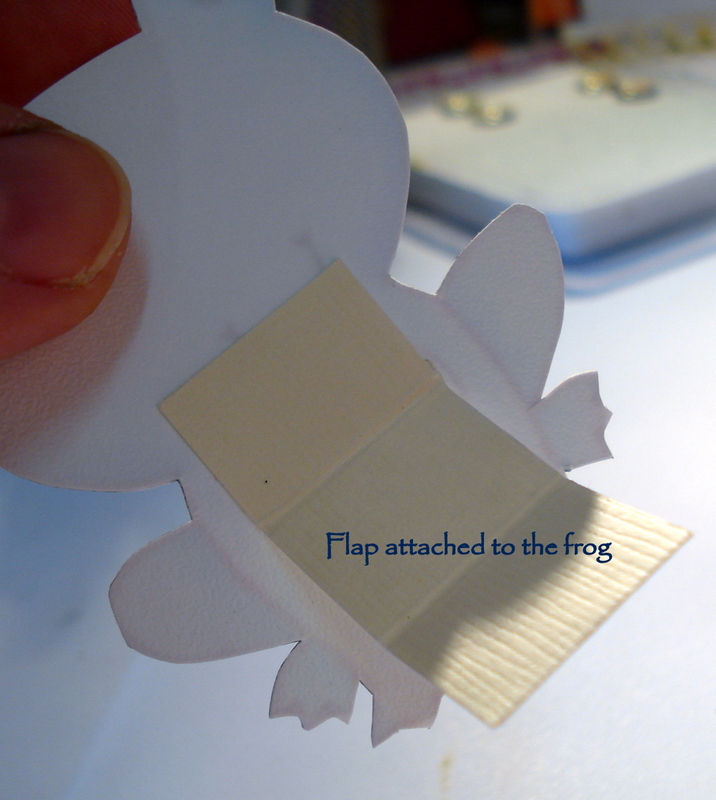 After bending up the frogs legs I then attach the other end of the flap to the lily pad. Just to note it's a good idea to lay your image flat on the card to see if where you have placed it is in a good spot to fit inside an envelope :D (learnt that one the hard way ;P). This is the card folded up ready to go into an envelope. If you look you can see where I've bent up the frogs legs (just so he sits nicely when up) & I have also pushed the flower up around the brad just for interest. Well I hope you have enjoyed this tutorial :D. Sorry if its a bit long. I think that this type of card would be great for any sort of scene. Like a bird in a tree or clouds. Fish swimming in the sea. Hasn't the month just rushed right by? I can't believe we are into July already. Rosemary, congratulations. This is one gorgeous card, it looks amazing! To see more of Rosemary's work please stop by her wonderful flickrstream here. Also for the month of July I am the hostess. 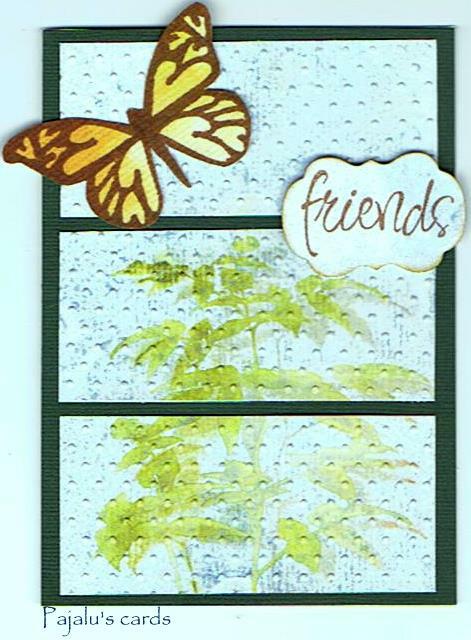 This month I want to challenge you all to pick a project ie: Card/ATC/LO or anything else you have done & re-do it. I am calling this challenge "Now & then". This card is the basis for my make over card. 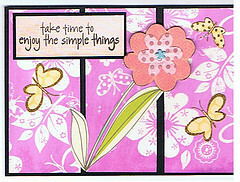 When I made this card it was my first attempt at a new technique Emboss resist. I didn't have a lot of supplies (no cuttlebug either). So I decided to give it a make over. My "Re-do" card. I used another new technique - Distress inks on water colour paper. 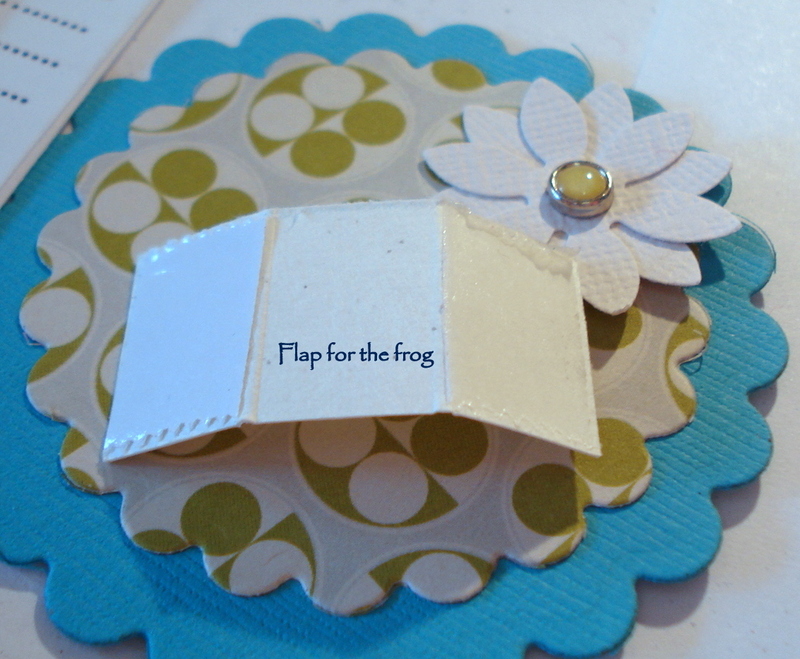 As you can see I've also embossed (cuttlebug this time) & added a nestie. I can't wait to see what you all come up with.